In a momentous move, by the Minister of National Security, the Honourable Robert Montague, approximately 136 District Constables of Batch 115, were sworn on as members of the Jamaica Constabulary Force on Thursday, August 10, 2017 at the National Police College of Jamaica in Twickenham Park, St. Catherine. In a bid to boost the human resource of the Force, these former members of the Rural Police were chosen from across the island due to their high levels of on-the-job competence, in addition to meeting the requirements needed to become regular Constables. 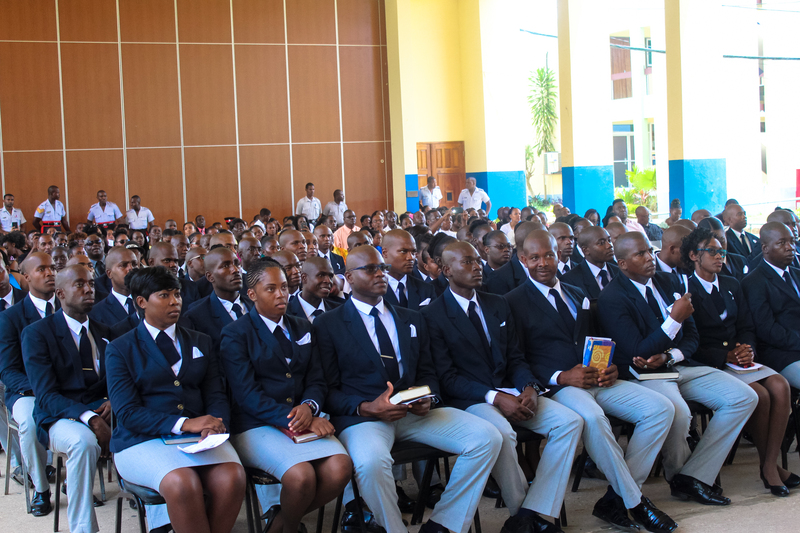 Among this new cohort of trainee constables, are Gregory Ranger and his sister Camille Ranger, children of a current member of the Constabulary, Woman Sergeant Mureen Ranger, who serves in the parish of St. Catherine. At the ceremony, which saw family and friends showing their support to the members of Batch 115, Woman Sergeant Ranger lauded her children for taking the bold step to become regular members of the Force. “I am so proud of my children and every one of you in this batch. I encourage you to persevere and be proud to serve your country regardless of the challenges you may face. Remember the oath you have taken and always be guided by the high quality service the JCF strives to deliver to everyone,” said Woman Sergeant Ranger, as she addressed the batch. Speaking at the ceremony, Assistant Commissioner of Police (Actg.) and the new Director for the college, Ms. Yvonne Martin-Daley charged the trainees to stand firm into the principles set out by the JCF and leave no room open for any wrong doing as law enforcement officer. “Be reminded of the attributes of a good Constable and the role of the Police, amidst the current crime situation we are grappling with. When you leave this stage of your training, ensure that you become agents of change and to invest in your professional development by constantly seeking to improve the way you Police the communities you are placed,” said Assistant Commissioner of Police (Actg. ), Ms. Yvonne Martin-Daley. This will mark the first time the Jamaica Constabulary Force will have a batch of District Constables graduating as regular members to join the ranks of the men and women who have served and those that continue to serve the people of this country.